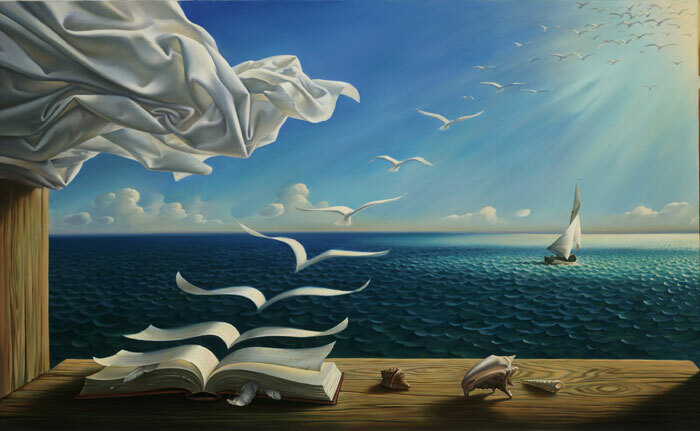 Vladimir Kush is a contemporary painter of Russian origin, who found an unlimited source of stylistic inspiration within the realm of historic surrealism. 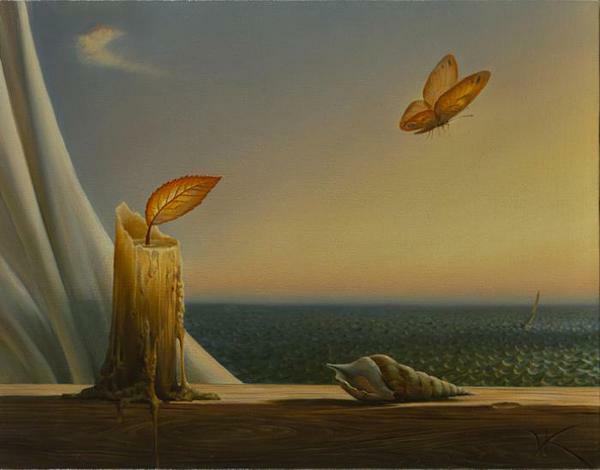 Born in Moscow in 1965, Vladimir Kush exhibited his creative nature as a very young boy and at the age of 7, he started attending art classes. He continued pursuing his artistic interest, but at the age of 17 his studies were interrupted by a mandatory military service. 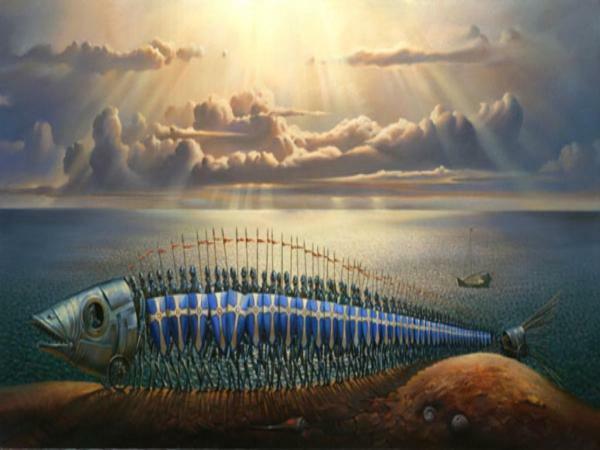 After serving his country, Vladimir Kush continued his studies at the Institute of Fine Arts, where he graduated. Early in his path, he used to work as a portraitist on Arbat Street in order earn some income during the crisis period in Russia. He never ceased to paint, and in 1987, Kush began exhibiting at renowned exhibitions organized by the Artists’ Union. Crucial point in his life path was an exhibition at Colburg, Germany Kush realized in 1990. The show was sold out, and allowed him to travel to Los Angeles with twenty of his fantastic paintings, where he showed another 20 paintings, marking a starting point of his American journey. First days in LA were difficult, as the artist was compelled to create in a tiny, rented garage space, without much success in finding a gallery. His sole wage came from portrait drawing on the Santa Monica pier, but after a while he did manage to purchase a ticket to Hawaii, his intended destination. 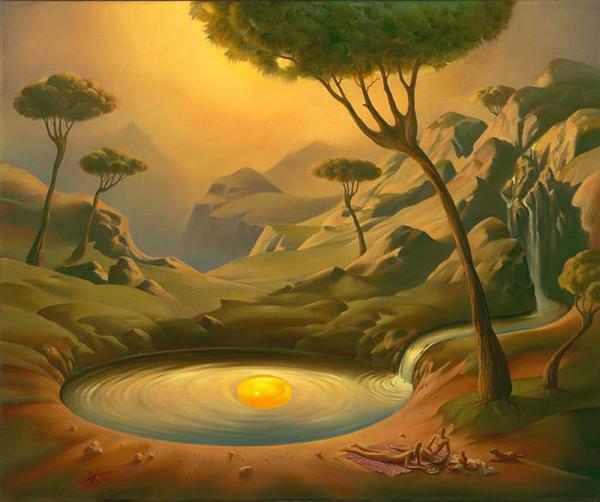 Vladimir Kush was discovered by a French art dealer in 1993, who organized his first big exhibition in Hong Kong, introducing his original approach to surreal to the art market. The exhibit was successful beyond expectations, and more shows soon followed, in Hong Kong and the American galleries in Hawaii and Seattle. 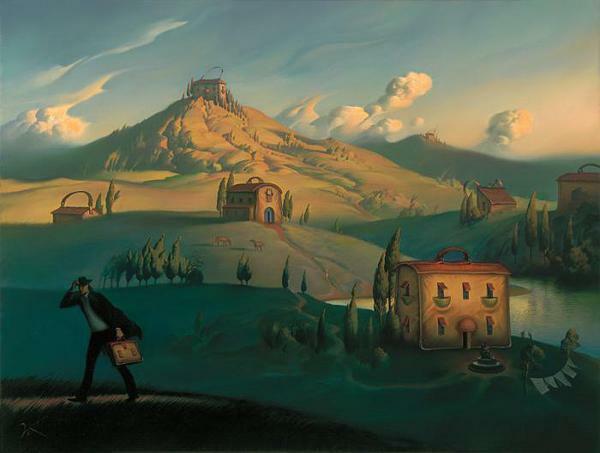 New century brought a new venture for Vladimir Kush, as he opened his own gallery in 2001 in Lahaina, Hawaii named Kush Fine Art Gallery. Today, this successful painter has four galleries around USA and plans to open more in other countries. 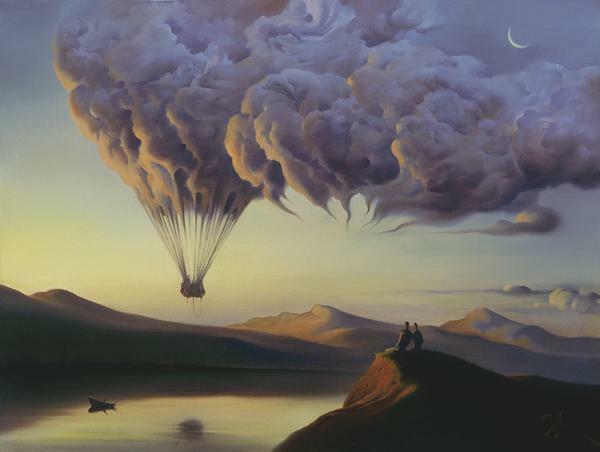 The style of Vladimir Kush is a unique addition to the contemporary art scene. Even though his expression is generally described as surrealistic, he prefers to label it as “metaphorical realism”, shying away from the historical connotations the name of surrealism might carry. He does not deny the great admiration he has for Salvador Dali, nor the impact Dali’s work had on his oeuvre. 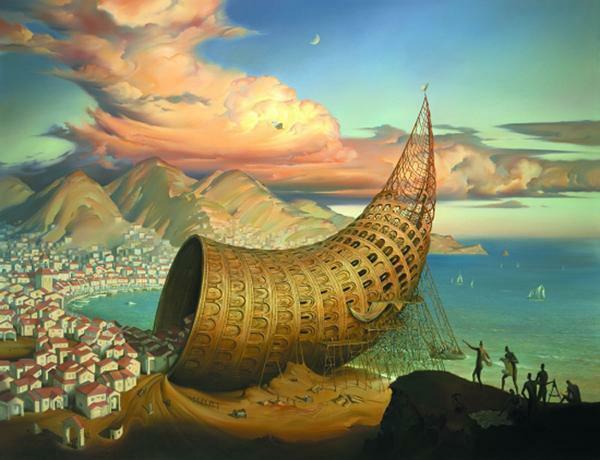 However, there are other influences read in the paintings of Vladimir Kush, such as German painter Caspar David Friedrich and the 16th century Dutch genius, Hieronymus Bosch. His iconography is filled with dainty depictions of flora and fauna, presenting butterflies, ships, wings, sea life and precious details, all set in an imaginary, Dalinian landscape, often illustrating wild and untamed nature. Flowing water is one of the leitmotifs of Kush’s painting, as well as the fusion of human and animal figures. He paints mainly using oil paint on canvas or board. As a versatile and prolific artist, Kush sculpts as well. His small scale sculptures in bronze present figures derived from his painterly body of work. 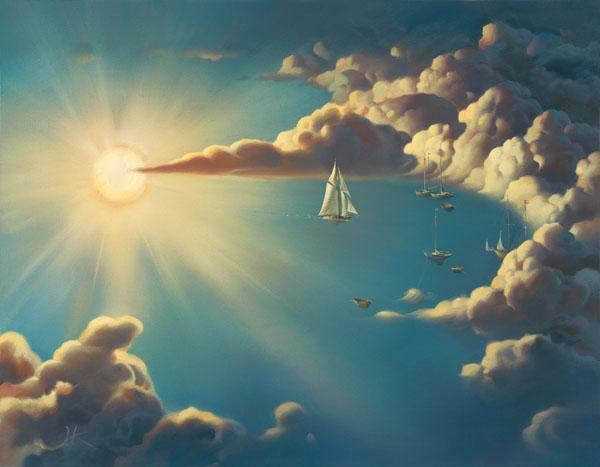 Vladimir Kush paintings are often reproduced and printed on canvas and he also issues prints and posters featuring his beautiful imagery. 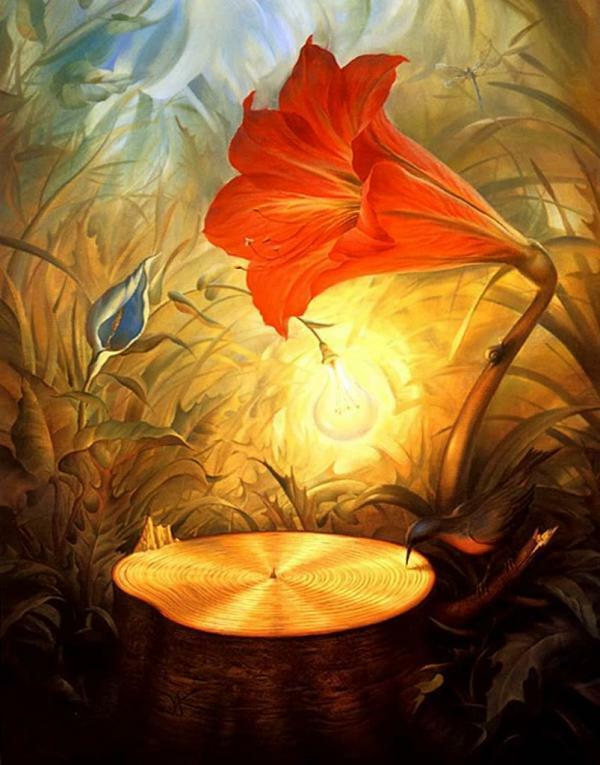 Vladimir Kush posters and prints are available through his galleries, as well as his original works. 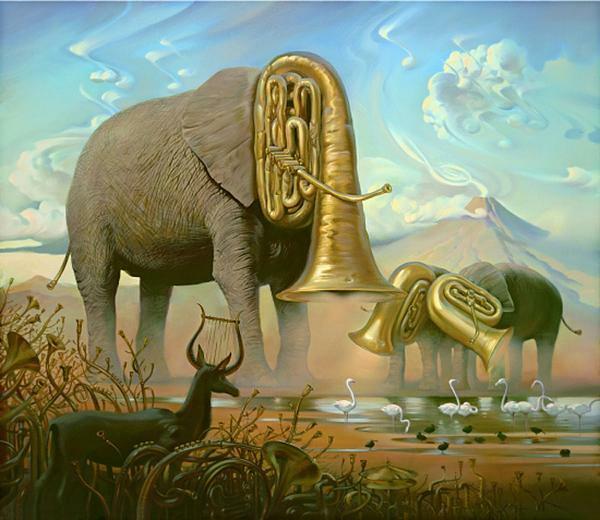 Giant tubas painted in place of elephant heads evoke the sound these noble, giant animals produce, while the vivid landscape takes us to the heart of Africa. This painting presents a romantic depiction of destiny. It is known that butterflies undergo a transformation, and the dainty narrative here optimistically introduces future of the small, or any, soul. There is nothing better than enjoying a wonderful landscape first thing in the morning. 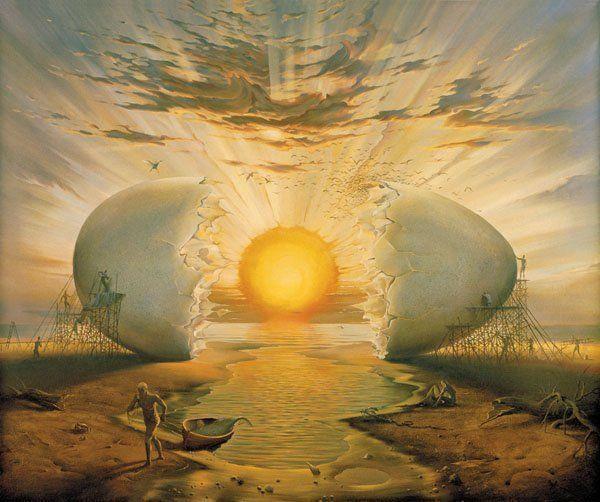 This painting metaphorically presents the perfect breakfast for the eye and soul, by using an adapted image of a traditionally prepared egg. 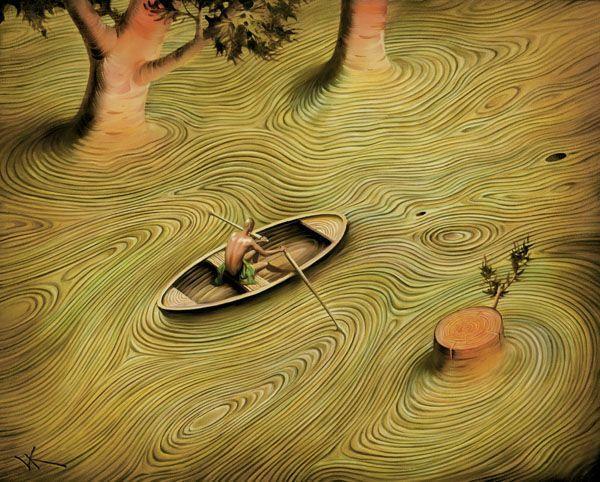 Illusion and double imagery enliven this work. As the crusaders are today a relic of the past, so is the large skeleton of a fish they form with their bodies. The age of a tree is known by the number of rings of the trunk. The true age of a man is known by the number and dynamics of currents that mark his life, which is a wonderful parallel made in this painting by Kush. 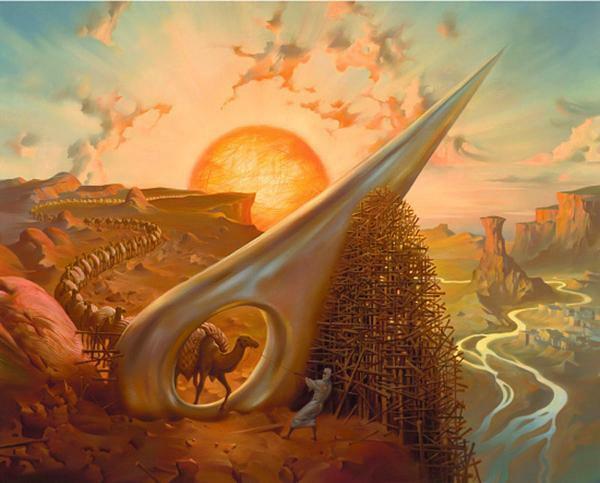 One of the most popular paintings of Vladimir Kush, it is often produced as a print. 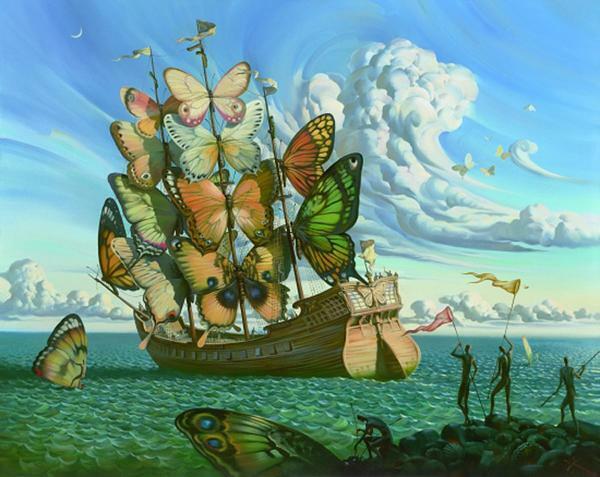 Massive, three-masted sailing ship is sailing towards the open seas, driven by enormous butterflies instead of sails. 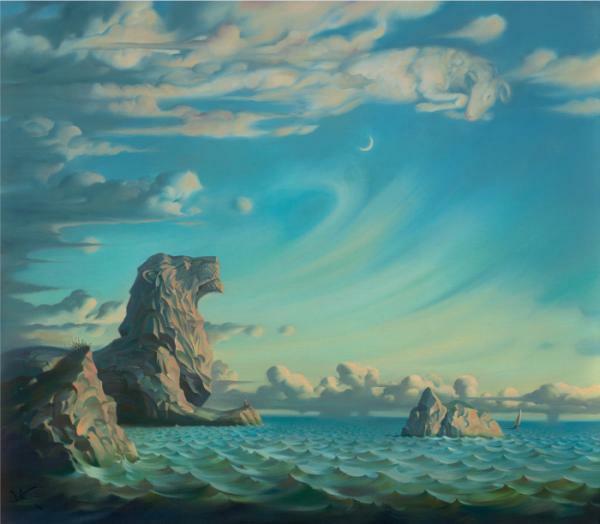 It stands for freedom and adventure, depicted in an imaginative oceanic landscape. Another metaphor for life. The human living spans through time like a caravan through the desert in search of water and prosperity, while the difficulties encountered are portrayed by the large eye of the needle through which each of us must pass. A Cezanesque landscape makes a backdrop for a rather pop artsy bridge. 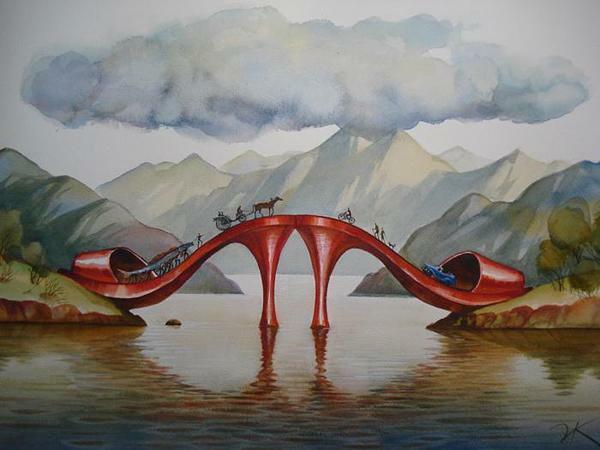 Taken as a symbol of beauty, high-heeled shoes create a beautiful line for the people to cross – another metaphor for one better life’s journeys. 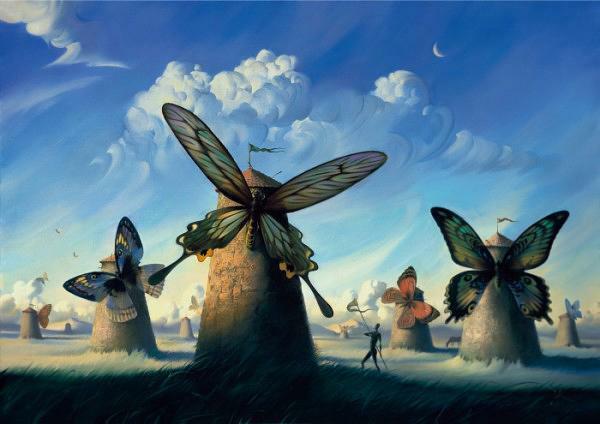 An overt reference to Don Quijote is depicted with the use of typical Kush iconography: turbulent skies, slim figures and large, vivid butterflies that make the windmill wings. Sometimes, by rejecting small objects of our everyday, we forget the meaning they carry. 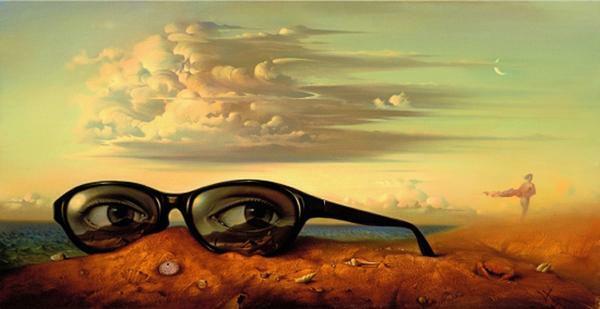 These glasses contain a view and a memory, mystical to the viewer, yet equally evocative. 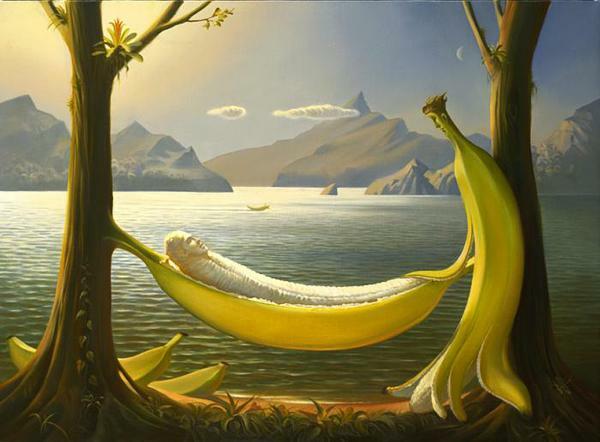 Banana people in a wonderful landscape may just be a fun pictorial play in a manner of Arcimboldo, while reflecting on the shortness of life. Whether we know it or not, we are all a part of a fleer that floats toward some kind of haven. This painting contains a commentary to the contemporary society, which is being consumed by the threatening horn of Babel of the past. A dynamic symphony of the inner search and peace achieved by the artist, through his lifelong exploration of deeper meaning. Ever been cloud watching? Every cloud resembles something, and transforms into something else. This lovely image is actually a genre scene, much more intimate than it appears at first glance. The forest is shiny and it sings, with all the colors, life and beauty it holds. Kush paints the song of the woods playing on a natural gramophone, alluding to the harmony of nature. 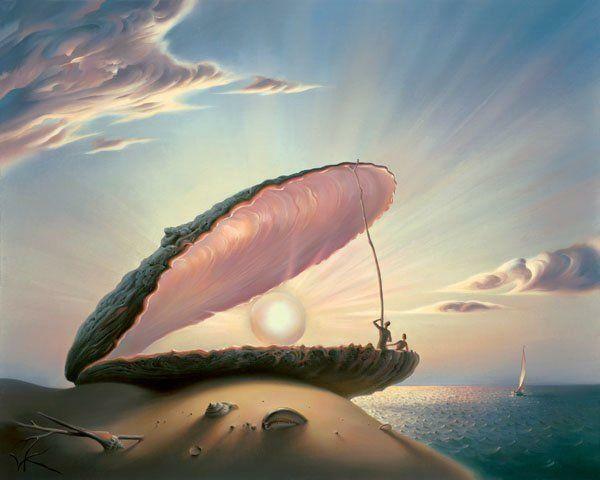 The most precious gem for our planet is the source of life on it – the Sun, here painted as a pearl in the giant clam we dwell in. 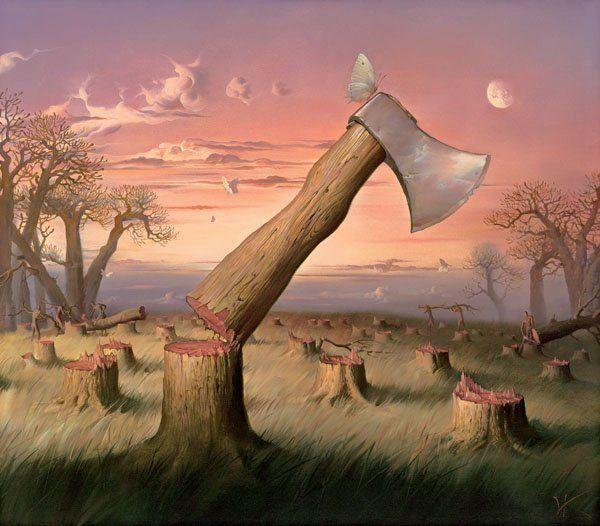 This painting represents an environmental commentary to the massive forest cutting, and a pictorial suggestion of the artist that this destruction ought to stop. We are born every day, thanks to the Sun. Contains the same allusion as the Breakfast on the Lake. 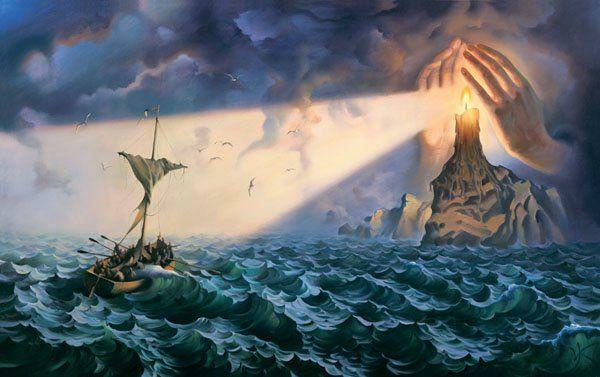 Artist’s vision of the higher power that is always watching and keeping us safe, regardless of the storm or trouble we might find ourselves in. The insinuation that every house is a bag, means that the eternal voyager always carries his home with him. All of the possessions are within one small bag, constantly on the road. 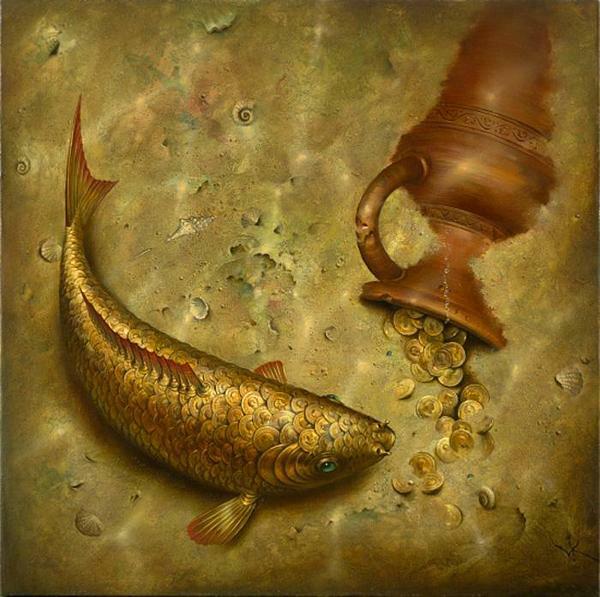 Vladimir Kush is an outstanding artist.